Gastroesophageal reflux (GER) is a universal phenomenon in preterm infants which occurs when the gastric contents enter into the esophagus. It is a common diagnosis in the NICU. Conservative measures to control reflux, such as left lateral body position, head elevation, and feeding regimen manipulation, have not been shown to reduce clinically assessed signs of GER in the preterm infant. The clinical report which appeared in the journal Pediatrics examined the physiology, diagnosis, and symptomatology in preterm infants, as well as currently used treatment strategies in the NICU. GER occurs commonly in infants, in part because of relatively large volumes ingested during feeding and supine positioning, which frequently place the gastroesophageal junction in a liquid environment. 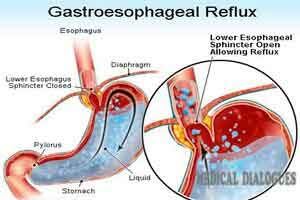 Whether GER becomes clinically significant depends on both the quality (eg, the degree of acidity) and quantity of reflux as well as potential injury to the esophageal mucosa. Pathologic GER occurs when reflux of acidic gastric contents causes injury to the lower esophageal mucosa. Although preterm infants do have some acidic GER episodes, most GER episodes in this population are only weakly acidic because of their lower gastric acidity and frequent milk feedings, making such esophageal injury unlikely to occur. Signs commonly ascribed to GER in preterm infants include feeding intolerance or aversion, poor weight gain, frequent regurgitation, apnea, and desaturation and bradycardia and behavioral signs, including irritability and perceived postprandial discomfort. In the data, the temporal association of these perceived signs of GER with either acidic or nonacidic reflux episodes as measured by MII and pH is not supported, and the signs will usually improve with time without treatment. The most accurate method for detecting GER in preterm infants is MII, often combined with simultaneous pH sensoring. MII tracks the movement of fluids, solids, and air and can show whether a fluid bolus is moving antegrade (swallowing) or retrograde (reflux), and how high in the esophagus it is. Measuring lower-esophageal pH alone is a not a reliable method. Although contrast fluoroscopy images episodes of reflux, it cannot distinguish between clinically significant and insignificant GER. Data regarding the possible association between worsening lung disease attributable to Gastroesophageal reflux and microaspiration in mechanically ventilated preterm infants are sparse. Further studies to elucidate such an association and to assess the effect of GER treatment on the severity of lung disease are needed. There is marked variability in the diagnosis and treatment of GER in preterm infants among NICUs, perhaps because the diagnosis is usually made by clinical assessment of signs and symptoms and/or a trial of nonpharmacologic or pharmacologic treatment rather than definitive tests. Conservative measures to control reflux, such as left lateral body position, head elevation, and feeding regimen manipulation, have not been shown to reduce clinically assessed signs of Gastroesophageal reflux in the preterm infant; for infants greater than 32 weeks’ postmenstrual age, safe sleep approaches, including supine positioning on a flat and firm surface and avoidance of commercial devices designed to maintain head elevation in the crib, should be paramount as a model for parents of infants approaching discharge from the hospital. Preterm infants with clinically diagnosed Gastroesophageal reflux are often treated with pharmacologic agents; however, a lack of evidence of efficacy together with emerging evidence of significant harm (particularly with gastric acid blockade) strongly suggest that these agents should be used sparingly, if at all, in preterm infants. There is marked variability in the diagnosis and treatment of Gastroesophageal reflux in preterm infants among NICUs, perhaps because the diagnosis is usually made by clinical assessment of signs and symptoms and/or a trial of nonpharmacologic or pharmacologic treatment rather than definitive tests.